In the previous post we discussed about general weather condition that are to be considered before forecasting of disease. Here we are going to discuss about the Mills tables that are to be taken into consideration for the prediction of disease. PS: When rain begins after sunset, leaf wetness should be assumed to begin at sunrise. For all other events, times should be computed from the start of rain. Note that night-released ascospores could cause significant disease in orchards with poor scab control the previous year (i.e., greater than 1% leaf infection at leaf fall). However, in low-inoculum orchards (most commercial orchards) when rain begins at night, ascospore release, and infection periods, should be assumed to start at dawn. When alternating wet and dry conditions exist, add the wet hours together, unless the dry intervals are 8 hours or longer. This post is in continuation to my previous post on “Apple Diseases: Apple Scab Disease Cycle”. 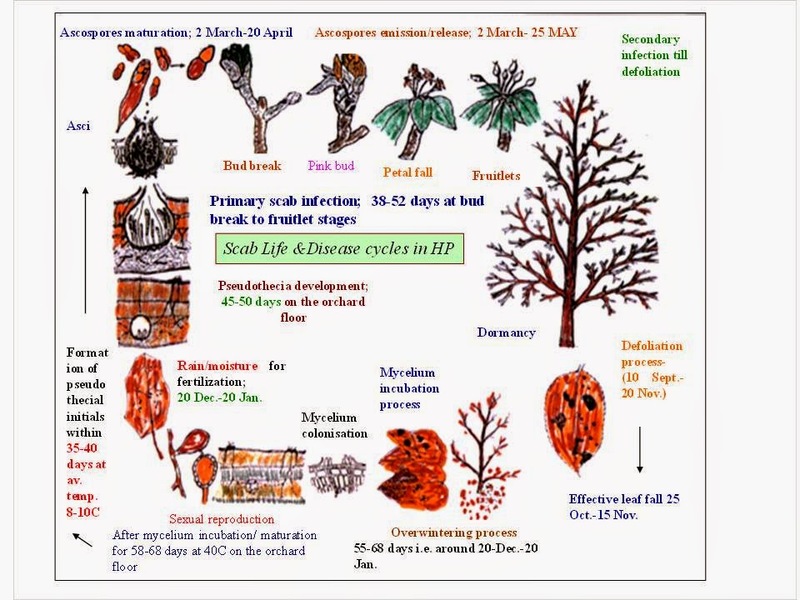 Here we are going to discuss about the climatic conditions that help the pathogen to over winter and produce primary inoculum for the primary infection thus help us in predicting the disease in advance. The scab fungus remained alive through winter in the dead and fallen leaves of apple on the orchard floor, and produced pseudothecia mainly in leaves which fell in September, October and November as the leaves of earlier dates did not survive in the hot autumn days and got decomposed quickly. Cool and moist climatic conditions due to rain or plenty of showers, available at higher elevation and in shady portion of the orchards were congenial for the development of pseudothecia in overwintering leaves within 30-35 days after leaf fall. When moisture was not a limiting factor (12-13 hr) and the tissues of fallen leaves had remained pliable, fungus started producing initials of pseudothecia at low temperature of 4 and 8oC but such pseudothecia which developed slowly throughout the winter season attained full size and became mature at an optimum temperature of 15oC. On the other hand, prolonged dry weather conditions in the winter and spring did not allow normal development of pseudothecia and a month or so delayed even the ascospore maturity. After the maturation of ascospores on the orchard floor, a light to moderate shower of rain is required to release the inoculum over to susceptible plant stages. This infection came from the late maturing ascospores at high elevation areas where overall development is always slow. Thus, it explains that low temperature due to snowfall is lethal to the matured ascospores and affects the infection process. In coming post we shall be discussing about the management of disease. This post is in continuation to my previous post “Diseases of Apple: Apple Scab Description” here in this post I am discussing Apple Scab Disease Cycle. The fungus Venturia inaequalis causes apple scab, which is now endemic to all apple- growing countries of the world, is particularly severe in areas having high relative humidity and rainfall. In winter, the scab fungus over-winters in infected leaves fallen to the ground. During autumn, the fungus begins to form tiny fruiting bodies, which are embedded in the leaves near the surface. Sacs filled with the primary or spring spores of the fungus start to develop within the pseudothecia by late winter or early spring. The ascospores continue to develop and mature as spring progresses. A few spores are usually mature at the time of bud break (green tip), and maturity progresses slowly until about the tight cluster stage of blossom development. After this time, the percentage of mature spores begins to increase rapidly whenever temperatures are favourable for tree growth. Most ascospores have matured by the end of bloom. Mature ascospores are discharged into the air during periods of rain. In daylight, discharge usually begins within 30 minutes after the start of the rain and is largely completed within 3 to 6 hours. When rainfall begins at night, discharge is often delayed until daybreak, although significant night discharge can occur under some conditions. The number of spores discharged during any one rain is determined by both the size of the potential ascospore "crop" for the season (how many leaves were infected the previous year) and the percentage of these spores that have matured since the last discharge. Ascospore discharge usually peaks in the time from pink through bloom, and nearly all ascospores are discharged within 1 or 2 weeks after petal fall. Ascospores are blown to nearby trees by wind currents, and they germinate in a film of water on the surface of leaves and fruit. If surface wetness continues long enough at prevailing temperatures, growth from the germinated spore penetrates and infects the organs just beneath the outer cuticle. Typical lesions, each bearing tens of thousands of secondary or summer spores, appear about 9 to 17 days later depending on temperature, although long periods of low humidity can delay their development. Conidia are dispersed by splashing rain throughout the rest of the season and are capable of causing new infections. This is due to numerous additional conidia are produced on each new lesion, repeated secondary infections have snowball or epidemic effect on disease development. Incidence of infection is affected by the age of leaves and fruit; young leaves generally are most susceptible 1 to 5 days after unfolding and become completely resistant from the time they finish expanding until shortly before leaf drop in the autumn. Fruit are highly susceptible until about 3 to 4 weeks after petal fall, but much longer wetting periods are required for infection to occur after this time. Precise requirements for infection of mature fruit are not known, but limited data indicate that wetting periods must last at least 48 hours for significant infection to occur immediately before harvest. This fungus over winters on infected leaves on the floor of the orchard. Spores are produced on these dead leaves at about the time new growth first appears in the spring. Spores are discharged during rainy periods and lodged on young leaves. If the trees are wet long enough for the spores to germinate, infection occurs. The infection originating from the over wintering stage is called primary scab. Infection depends on air temperature and continuous wetness of the plant surface. At a given temperature, the surface must be wet for a given number of hours. The average temperatures listed in the table are calculated by averaging the hourly temperature during the wet period. Research has shown that ascospore discharge is significantly reduced in darkness, i.e. only 5 per cent of the available ascospores will be discharged when wetness periods begin at night. Whether this 5 percent ascospore number is significant depends upon disease pressure in particular orchard. For example if there is a large amount of over wintered inoculum, 5% of the total ascospore dose could cause severe disease problems. However, under the disease pressure normally prevalent, the number of ascospores released at night can probably be disregarded. When trees are dry for less than eight hours between showers, add together the periods they are wet in calculating the infection period. Spores produced on a primary scab lesion are responsible for secondary infections. Secondary infection can occur in 12 to 20 days. Several microcomputer based disease forecasting systems incorporate the Mill's information. Apply sprays to control secondary scab if one or two primary scab lesions per tree are present.